EWG scientists reviewed Honest Beauty Everything Primer Matte for safety according to the methodology outlined in our Skin Deep Cosmetics Database. We assess the ingredients listed on the labels of personal care products based on data in toxicity and regulatory databases, government and health agency assessments and the open scientific literature. 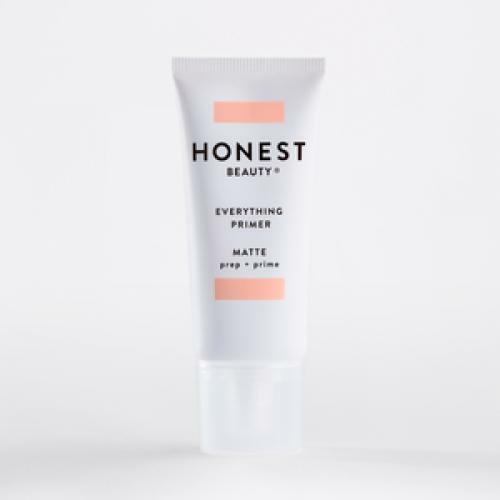 EWG's rating for Honest Beauty Everything Primer Matte is 2. Water (Aqua), Caprylyl Caprylate/Caprate, Propanediol, Methylheptyl Isostearate, Silica, Glycerin, Polyglyceryl-2 Stearate, Tribehenin, Behenyl Alcohol, Bambusa Arundinacea Stem Extract, Capryloyl Glycerin/Sebacic Acid Copolymer, Glyceryl Stearate, Undecane, Stearyl Alcohol, Lauroyl Lysine, Oryza Sativa (Rice) Bran Extract, Helianthus Annuus (Sunflower) Seed Extract, Rosmarinus Ocinalis (Rosemary) Leaf Extract, Tocopherol, Aloe Barbadensis Leaf Juice, Triticum Vulgare (Wheat) Seed Extract,Tridecane, Xanthan Gum, Linum Usitatissimum (Linseed) Seed Extract, Magnesium Aluminum Silicate, Hydroxyethylcellulose, Phospholipids, Trisodium Ethylenediamine Disuccinate, Ribes Nigrum (Black Currant) Leaf Extract, Rubus Idaeus (Raspberry) Leaf Extract, 1,2-Hexanediol, Caprylhydroxamic Acid, Sorbic Acid, Limonene, Linalool, Geraniol. Gently blend a dime-size amount of the Everything Primer all over face as the first step in your makeup routine. Use under the Everything Cream Foundation for a glowing complexion. Avoid contact with eyes. Caution: Avoid direct contact with eyes. In case of irritation, discontinue use and consult your doctor.